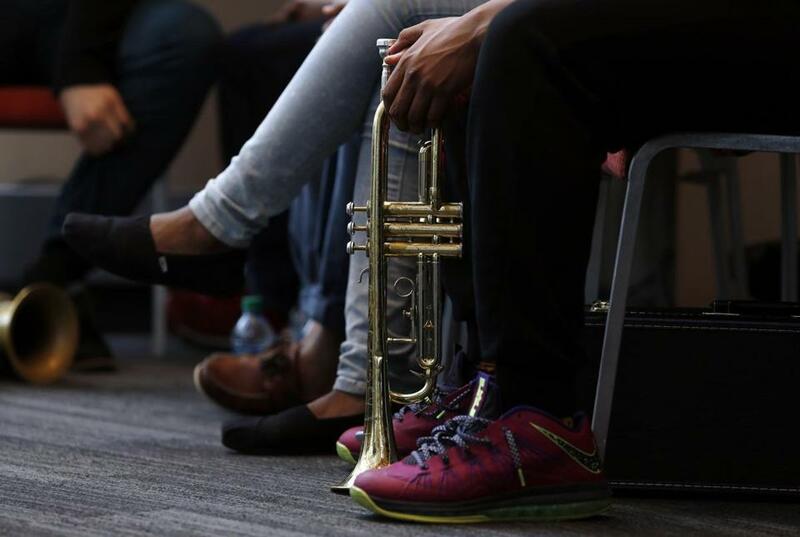 A Boston Arts Academy student sat with a trumpet between his feet at an event at Berklee College of Music. Boston Arts Academy, long housed in a former postal office warehouse behind Fenway Park, would finally get a state of the art building under a proposal being filed with the state Thursday, a school district official said. John Hanlon, the chief of operations, said the plan to replace the high school building on Ipswich Street is long overdue. “They are a state of the art program that is not in a state of the art building,” Hanlon said. The proposal calls for the blond-brick building to be torn down and replaced by a five-story building that would include a black box theater, four dance studios, a choral room, a recording suite, an orchestra room, and an auditorium. “Overall, every floor will be designed to double as a stage, every wall a gallery,” Superintendent Tommy Chang wrote in a May 15 letter to the school community formally unveiling the proposal. The new Boston Arts building — located in one of the city’s most popular tourist destinations — would probably turn into Mayor Martin J. Walsh’s most visible effort to overhaul the city’s school facilities. Most of the city’s other buildings are tucked inside residential neighborhoods. Walsh has committed to spending $1 billion in city and state funds over the next 10 years to upgrade the city’s 125 schools. The Boston Arts project could exceed $100 million, Hanlon said. Two-thirds of those costs might be eligible for state reimbursement from the Massachusetts School Building Authority. If approved, construction could begin in mid-2018. Matthew Donovan, a spokesman for the School Building Authority, said the agency is looking forward to reviewing the proposal. Boston Arts Academy, which serves 450 students in grades nine through 12, has been hunting for a new building ever since the school opened in 1998. The building has a lot of deficiencies, including dance studios with support beams in the middle of them and no space for an auditorium, placing limits on its performing arts programs. Former superintendent Carol R. Johnson unsuccessfully proposed in 2011 moving the school into Boston Latin Academy’s building. Then the school system thought it finally found a suitable location in 2013 for a new building in Chinatown that could be jointly occupied by Boston Arts and Quincy Upper School. But a year later, the School Building Authority balked at the estimated price tag of $244 million, which would have broken state school construction records. Since then, the authority has been working with the school system on alternative proposals. Initially, the school system was planning a modest renovation to the building but then decided it was more feasible to erect a building specifically designed for visual and performing arts programs. If approved, the Boston Arts Academy would temporarily relocate during construction to the former Grover Cleveland building on Charles Street in Dorchester, which currently houses Community Academy for Science and Health and Dorchester Academy. Boston Arts would cohabitate with Community Academy, while Dorchester Academy would move into the Endicott building on McLellan Street in Dorchester, which is currently being leased by a charter school. That lease expires next year.